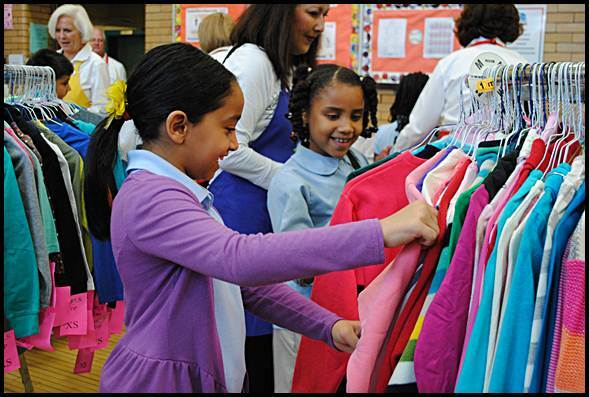 Hamtramck Public School students were recently treated to free clothing, thanks to the Assistance League of Southeastern Michigan. Last week’s “Operation School Bell” was a ringing success. As part of one of its many yearly service projects, the Assistance League of Southeastern Michigan (ALSM) was in town to distribute new clothing to students. It was the third time in as many years that the ALSM has visited Hamtramck. Just like in years past, each child received two pairs of pants, two shirts, underwear, socks, hygiene items, a book, a winter coat with hat and gloves and a $15 shoe voucher – all stuffed into a duffel bag. The only difference this year is that one set of clothing was a new school uniform. Each child was chaperoned by an ALSM volunteer around the makeshift “store” that was set up in the Dickinson East Elementary School gym. Different sections were set up for each item, and each child was allowed to pick out their own outfits and accessories. Altogether there were 80 volunteers on hand to manage the store, which serviced about 300 kids from the district’s three elementary schools. Each bag contained about $85 worth of goods.